Delivery: Sent within 1-4 weeks, depending on the amount of work required. A custom coat of arms is ideal for company logos, school badges, or for any other purpose you may have in mind. See some examples of our custom coats of arms by using the link below. 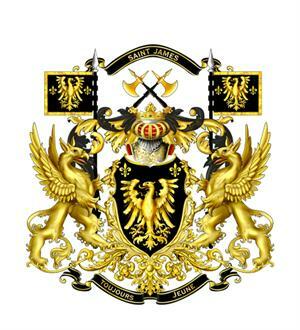 We will create your custom coat of arms from your instructions for a very reasonable price, you may choose to have just a basic shield, helmet and mantel, or for an extra amount you can add a crest, supporters and a motto. If you would like some ideas for a motto for your custom coat of arms, please go here. Once you have completed all the information, and paid the correct sum, we will contact you for further information asking you how you would like your coat of arms to look, at this time you will be able to tell us what illustrations and colors you would like to use, plus any other information you may feel to be of importance. Each customer is shown a proof of our initial design, and will have the opportunity to make minor corrections at no extra cost, however if you decide to change illustrations, or add extra illustrations etc. this may incur an extra charge, normally between $10 - $50, we will repeat the process of showing you proofs and making corrections until you are 100% happy with our design. The final design will be sent on a CD-ROM, and will be accompanied by a printed copy, at which time the sole copyright of the design becomes yours to use wherever you wish. The examples below are actual coats of arms we have completed as custom coats of arms for some of our customers. Or to see more examples go here.